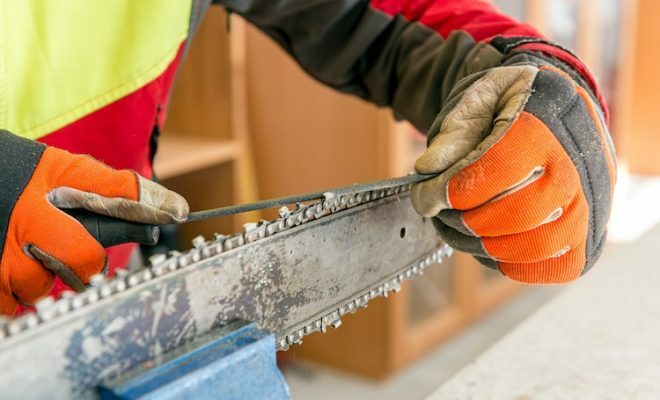 Home›Buying Guide›How To Choose a Chainsaw Chain? The difference between professional loggers and beginners is that the first ones know exactly how to determine the quality of a chainsaw. Assessing chainsaw power alone is not enough, as the most important thing is the cutting element configuration. 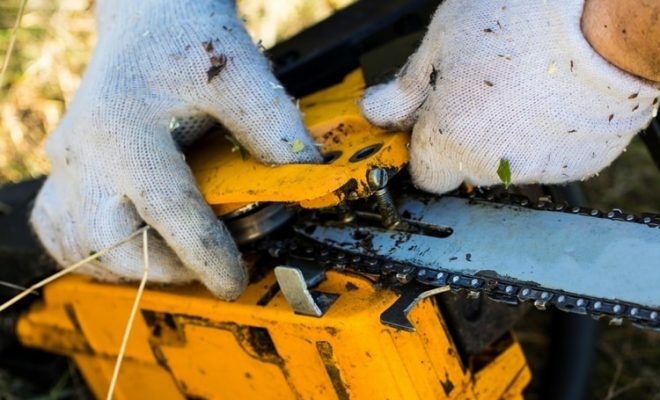 In case of a chainsaw, the cutting element is a chain that consists of cutting, driving and connecting links. The cutting link includes a depth stop and the cutting element itself, which operation is somewhat similar to the plane, that is, the thickness of wood chips depends on the degree of protruding of the upper edge. The driving link performs a function of rotating the chain along the groove and distribution of the lubricant while connecting links connect the rest chain elements. They are always at a strict angle; the same applies to the subsequent sharpening since the slightest change in the angle in either direction will result in the chainsaw failure. Such tools were first used in 1920, but teeth were flat and straight at that time, which could not but affect the final result of cutting and using such saws was quite difficult. A kind of breakthrough was in 1947 when a fundamentally new type of chain teeth was introduced – the L-shaped teeth made cutting much faster, teeth sharpening process was also simplified, so it is not surprising that this invention of Joseph Cox quickly became a best seller. If talking about our days, we have almost the same version of a chainsaw based on a chain system with a sickle-shaped cutting profile, for which the type of wood is not really important. What to note when selecting a chainsaw chain? Key chain characteristics include its pitch, thickness of the shank or drive link, the depth of cut and profile size, as well as the chain length. The cutting direction is also important. It is these parameters that you need to consider first when buying a new chain instead of an old one or when you need to buy a chain for some special needs. Check the manufacturer’s technical characteristics indicating the main saw parameters to be sure. If you are buying a chainsaw for the first time, these parameters should correspond to its future usage. 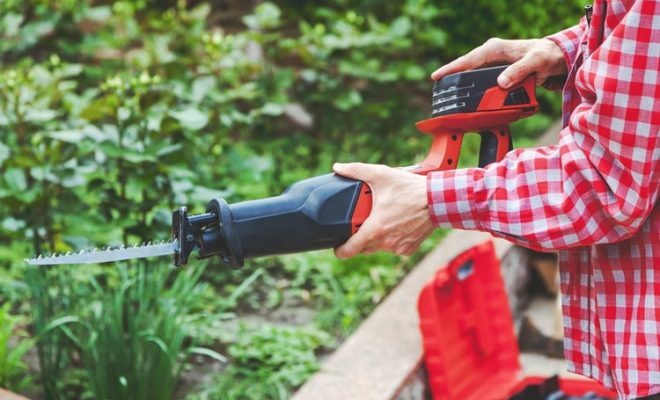 A pitch of 0.25 inches (6.35 mm) is used in saws with a minimum power suitable only for gardening. You can’t cut logs with chains with such pitch. Chains for chainsaws with this pitch are not common. The next two groups with a pitch of 0.325 and 0.375 inches (8.25 and 9.3 mm accordingly) accordingly are the most common as about 70% of all chainsaws produced in the world belong to these groups. Accordingly, they can be used for most domestic tasks. But there is one little trick! Since it is quite easy to confuse the numbers 0.325 and 0.375, chains with a pitch of 0.375 are indicated as 3/8, that is 3/8 inch. The last group with a pitch of 0.404 and 0.75 inches (10.26 and 19.05 mm) is used for most difficult tasks. It is more of a logging tool, rather than a domestic saw. That is, chains with this pitch are found only on professional chainsaws. There is a direct relation between the pitch size and saw performance, but you must remember that a large pitch supposes a more powerful engine. The cutting quality of saws with a large pitch is still less than the cutting quality of devices from the first three categories since they have more dense teeth. 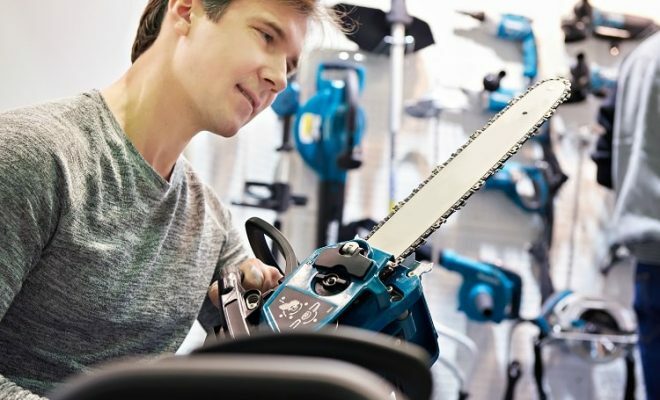 For a power of 2.5 liters, a pitch of 0.325 mm is fine, while a more efficient chainsaw should be better equipped with a saw blade and chain of 3/8 mm, as it will unlock the full potential of the saw. Saw chains can be also divided into several categories according to the drive link thickness. This parameter can have the following values: 1.1; 1.3; 1.5; 1.6; 2 mm (0.043″, 0.050″, 0.058 “, 0.063”, 0.080 “). It is usually measured in inches and affects the blade smoothness at cutting. 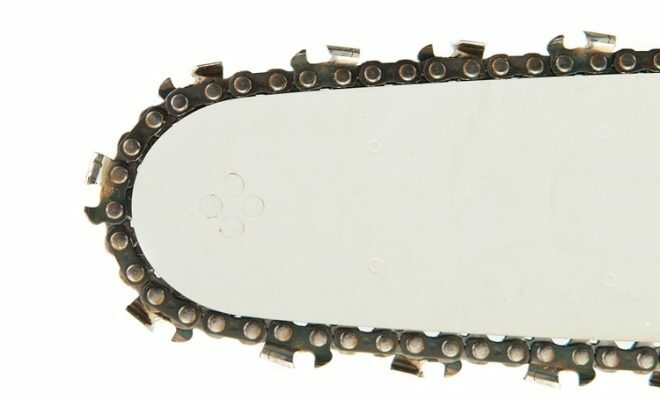 Chains with a pitch of 1.1 mm are used on low-power domestic chainsaws, as well as on chainsaws for carving. Chains with a pitch of 1.3 mm are more common. For example, the famous Stihl MS 180 has chains with exactly this pitch. And this is the most popular pitch in general. A pitch of 1.5 and 1.6 mm is used in chains for professional and semi-professional (farmer) chainsaws. 2 mm – this pitch is used only on chains installed on very productive and powerful professional chainsaws. What should you know about the chain profile height? It determines the depth of cutting. According to this parameter, saws can be of either low or high profile. Wood chips of the first ones are thinner, but the saw operation a little slower, whereas the second group has a higher cut depth and performance. For low profile saws, this parameter is 0.635 mm, for high profile ones – 0.762 mm. Chainsaws for domestic use are always low-profile. Professional saws can be of two types. In order to stabilize the vibration during the operation, manufacturers create a balance between the profile height and the number of pitches. For a small pitch, manufacturers make a high profile and vice versa. Failure to comply with this standard results in an inability to use a chainsaw for a long time, although wood will be cut very quickly. This balance should be observed if you need to do sharpening at home, in all other situations you can only choose a saw either for domestic or professional cutting. If considering the most common types of chains, these are chisel chains mostly used on professional equipment and chipper chains used at simple chainsaws. The first one resembles 7 in the cross-section that allows using a saw as fast as possible, as the chain fits into the material evenly. The cutting is more accurate, but sharpening such chains at home is very difficult since the slightest deviation from the acceptable angle reduces all advantages of this construction. In case with chipper chains, there is no need to adhere to strict angles, such chains are not really afraid of dirt, although the load is higher. The second type is better for domestic use, especially if you have no saw sharpening skills. As for the material, mainly chromium-nickel steel is used, although for cutting a particularly strong material, teeth can have carbide taps according to the teeth marking. The chain name corresponds to the direction of cutting wood fibers. The sharp angle of sharpening is not required for cross-cutting because the wood resistance, in this case, is less than at ripping. 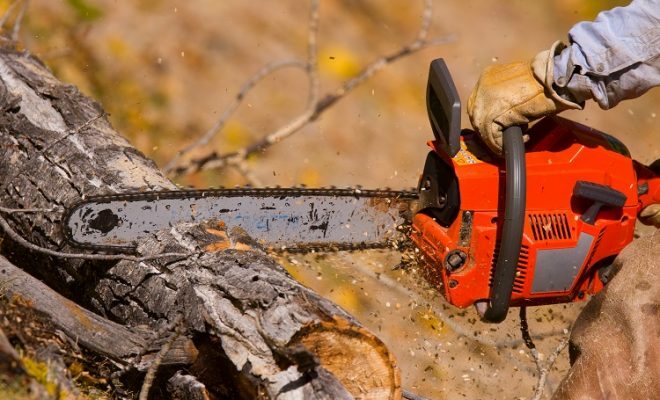 Each type of wood supposes choosing a certain direction, and if it is used for professional wood processing, including ripping, teeth must be grinded up to 5-15 degrees, while 25-35 degrees are enough for domestic tasks. Demand for ripping chains is very small since it is more reasonable to use a circular saw for ripping. Sometimes it is difficult to find a ripping model even in a specialized store. There is no sense to look for such saw for domestic tasks since all domestic cutting can be easily performed by cross-cutting tools. How to know what type of saw you need: for ripping or cross-cutting? For cross-cutting, the angle of chain sharpening is 30 degrees. For ripping, the angle of chain sharpening is 10 degrees. Is the sequence of cutting links important? In the standard kit, when the saw is manufactured at the factory, it has two leading links on one cutting chain, thus, a total of 50% of cutting teeth. Then, the performance and the cut quality are high, but to make the chain price cheaper, cutting links can be installed not on every pitch, but in one or even two pitches, reducing the total number of cutting chains to 37.5%. Such chainsaw is cheaper, but the cutting quality is lower, so we recommend not considering such tools for purchase. Such chains have a much higher price and a special purpose – cutting frozen wood or dirty material. In all other situations, they are a waste of money, since there is no sense in carbide tacks for plain wood.